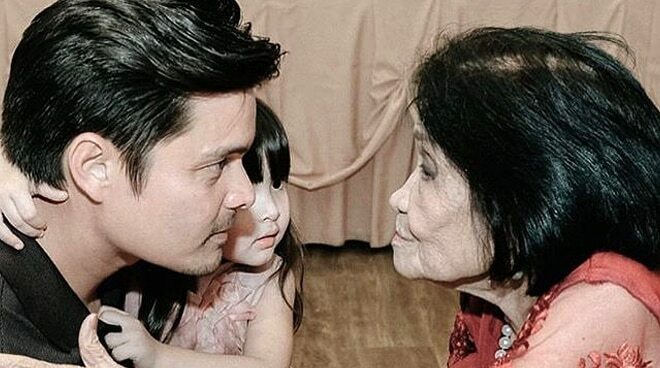 On her dad Dindong Dantes’ Instagram was a series of photos taken during the three-year-old’s first introduction to her centenarian great grandmother. Zia Dantes, daughter of celebrity couple Marian Rivera and Dingdong Dantes, met for the first time her 100-year-old great grandmother at the latter’s grand birthday celebration last Wednesday, March 27. Posted on the ‘Fantastica’ actor’s Instagram was a series of photos taken during the three-year-old’s first introduction to her lola Choly. “Immediately after the priest’s blessing last Sunday, we approached the celebrant, Mamang Choly, and greeted her. Look at how amazed Zia was upon meeting face-to-face for the first time her 100-year-old Great Grandmother,” he wrote. Another post showed Zia doing the customary ‘pagmamano’ as show of respect to her centenarian great grandmother. Meanwhile, noticeably missing from the whole affair was Marian, who back in September announced that she’s currently expecting her second child with Dingdong. It was later revealed that they are to have a baby boy. The couple welcomed Zia on November 23, 2015, nearly a year after they tied the knot in a highly-publicized church wedding.